This is a partial repost. 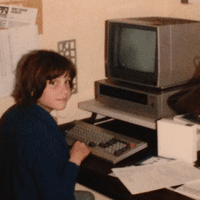 Links to resources have been updated, an embarrassing childhood photo added, but the sentiment remains the same: An Hour of Code Can Change Lives. My dad was a tinkerer. He built TVs from kits, fixed lawn mowers with spare parts, and made wooden rubber band rifles. I was his helper, always ready to hand over the requested tool. In the early 1980's he brought home a Texas Instruments computer. At the time I believed computers were the tools of scientists, the government, or big companies... certainly not 8 year old girls. After unboxing we spent hours figuring out what this machine could do. I'm pretty sure we skipped dinner that night. We designed simple programs to add numbers, tell jokes, and draw shapes. We saved our projects on cassette tapes, sharing them other lucky computer owners. That first hour of code changed two lives. My dad was beginning to turn his hobby into a career; by the late 80's he went from warehouse worker to CAD designer. I was turning a "toy" into a learning tool, developing programs to help practice multiplication tables and spelling words. Many years later I have the best job in the world: I get to help make learning more effective, authentic, and fun through the use of technology in schools. Next week, during Computer Science Education Week, we celebrate the Hour of Code. I challenge you to try something new: step out of your comfort zone and play a simple game. Drag and drop commands to build a Star Wars galaxy, make your own Flappy Bird, or make a cat dance. Browse the links below for more options. Think about how these tools can work in your classroom -- not just the computer lab. Think of coding as another communication tool. What ideas are your students struggling to share? How can we use the principles of coding to engage students in our classrooms?